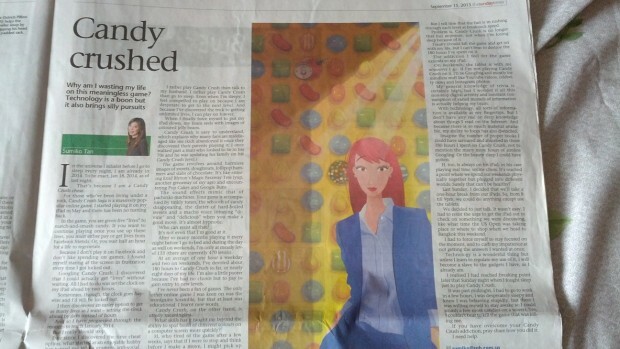 I refer to your recent article titled “Candy Crushed” in the 15 September 2013 edition of Sunday Life! at page 15. 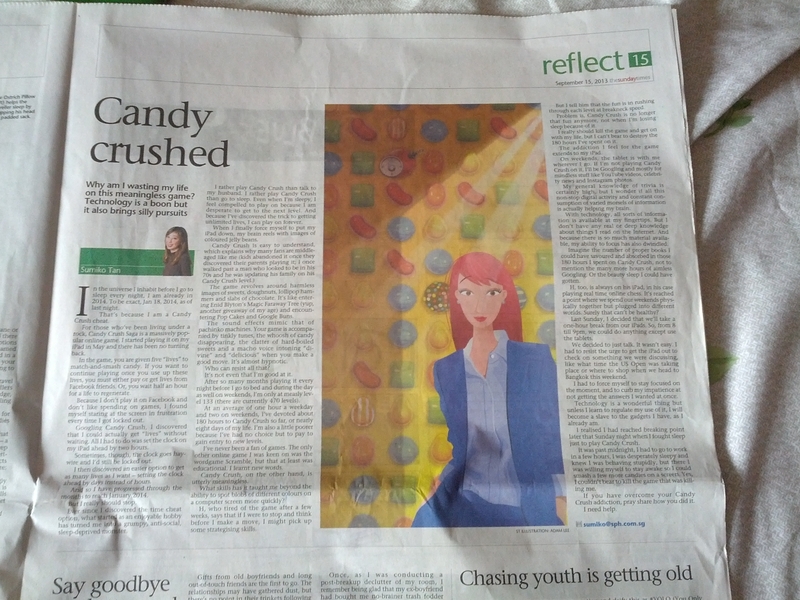 Reading about your videogame experience with Candy Crush made me both happy and sad. I am happy for you, because you have finally discovered the joy and wonder of playing videogames. I feel sad, because in your article, you immediately attributed this as a waste of time (“wasting your life”), and that playing games are “utterly meaningless”. Never ever say that videogames are a waste of time. Why should games be different from any other hobby or recreational activity? Some people like to collect stamps, others have a passion for cooking, some like to indulge themselves in television shows and pop culture all day. We do these things because we want to, because we enjoy it and love it. You probably didn’t want to admit it in your article, but I can tell that you are in love with the game — so much that you even resorted to cheating in order to increase your playtime. There is absolutely nothing wrong with cheating in a videogame, and don’t let anyone else tell you otherwise. As long as you are not illegally hacking the game software, or ruining the game experience for other players, by all means, cheat to your heart’s content. Quite recently, I had to resort to cheating in Borderlands 2. It made me feel really upset and uncomfortable for awhile, but I eventually got over it after a few days. Cheating is a culture that is very commonly found in videogames, and some gamers even feel that as players, they are entitled to use cheats whenever they play. This is an argument for another day, and is not the intent of this letter. My point is: please continue to play videogames (although I highly recommend something else besides Candy Crush) and stop feeling guilty about it. I have lost count of the amount of late night gaming sessions I’ve had in the past with work looming only a few hours away. This is an absolutely normal experience for a gamer! Yes, you have probably read many nightmare news stories about gamers who have died after playing videogames for obsessively long periods of time. But this can be applied to virtually anything else really — excessive indulgence in smoking, alcohol, twerking, and even drinking too much water can all lead to fatal consequences. You seem to be a responsible working adult, and I trust that you will be able to moderate yourself and still take care of your body while gaming. The next logical step of your newfound gaming hobby, is to find some multiplayer games that allow you to play with other real people. You mentioned that your husband enjoys online chess — well, why not play a few online games together with him? If chess is not your fancy, I highly recommend You Don’t Know Jack, an irreverent trivia game with asynchronous multiplayer that draws questions from pop culture, current affairs, and other (silly) topics. I am absolutely positive that you will like it, since you mentioned that you were confident of your general knowledge. Again, videogames are never a waste of time, and do not allow other people or some pre-conceived notions dictate what you can or cannot do. Enjoy doing what you love, and love doing what you enjoy. On behalf of the many other gamers in Singapore, I would like to welcome you to the world of videogaming. It’s never too late to start. Please play more, and continue to write more: I am looking forward to any future articles about your gaming experiences. [email protected] Gaming Challenge RESULTS!